Phone Cleaner does everything to speed up phone performance. 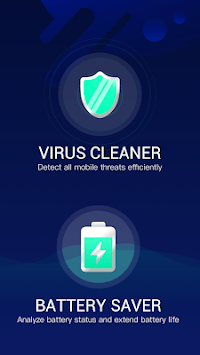 It comes with a range of Space Cleaner, Antivirus & Booster, the most powerful phone cleaner app with Super Speed Booster, Free Antivirus, Junk Cleaner, Virus Cleaner, CPU Cooler and Battery Saver and App Cache Cleaner.Free up storage space and boost phone speed! 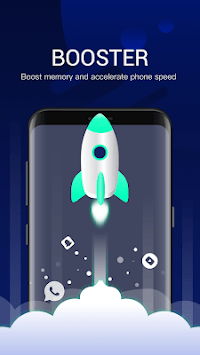 Junk Files Cleanerr : Clean junk files and boost phone speed. Notifications Cleaner & Manager : Manage and organize notifications effectively. Super Secure App Lock : Additional protection for your privacy. 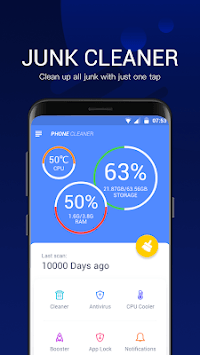 Based on our powerful Junk-Scan Engine, Phone Cleaner can analyze and safely remove the junk files that occupy your valuable memory and storage space. Releases space with just one tap. More intelligently, it automatically informs you of junk overload when necessary. Clean residual cache files frequently left by uninstalled apps to free up your phone or tablet disk space. Clean up duplicate photos, music, documents and unnecessary apps, frees up space and accelerates your device efficiently. Annoying notifications on your device driving you insane? Phone Cleaner also includes unique app organizer planner that manages and organizes notifications effectively. Powered by a world-class virus and threat detection engine, scans viruses on all apps (pre-installed or not), blocks and removes viruses to keep your phone safe from viruses, trojans and protects your privacy with the app. With App Lock, you can add extra password protection to sensitive apps, such as Facebook, Message, Tinder, Instagram, WhatsApp and Snapchat. Stay away from privacy snoopers by having an extra pattern, PIN password and even fingerprint. Love Phone Cleaner? Free try it now.